We have assembled equipment kits that will allow you to culture 500 mls (about 1/2 a quart) of algae per day up to 19 liters (5 gallons). The primary kit is designed for maintaining starter cultures or provide about 500 mls of algae per day. Normal grow out of microalgae is 7-10 days and then it is restarted from the starter or mother culture that you always maintain. Starter algae cultures are available in kit form or you may purchase them individually. If you desire 1 liter (about 1 quart) of algae per day then our Secondary Equipment Kits are more suitable. 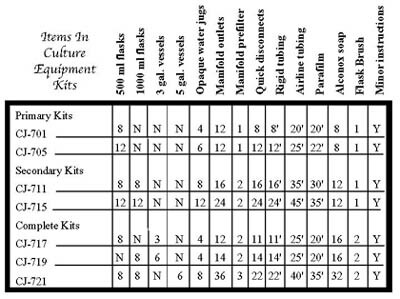 For larger volumes from 11 to 18 liters (3-5 gallons) per week or day then choose from our Complete Equipment Kits. The only variance between the kits are the number and size of the culture vessels. All kits will include culture vessels consisting of glass flasks and/ or large plastic carboy culture vessels. Opaque water storage bottles for the started cultures. Air manifold and manifold prefilter. Rigid and soft airline tubing with quick disconnects. Parafilm, a sealant film for covering the neck of the flask culture vessels. Laboratory soap and flask cleaning brush. Minimal culture instructions are included for more detailed instructions see our Plankton Culture Manual and Plankton Culture Kits. These kits can also be used for culturing microalgae and zooplankton such as rotifers, Artemia and Daphnia. The kits are suitable for fresh or saltwater culture.